The Royal St-Lawrence Yacht Club invites you to become a part of the experience which has allowed our Club to successfully achieve a goal that has been recognized as part of history. The uniqueness of being on the shores of Lake St-Louis makes the Royal St-Lawrence Yacht Club the perfect venue for weddings, conferences and seminars. For your convenience, Royal St-Lawrence Yacht Club has a wide range of facilities and audiovisual equipment available for your use and we look forward to working with you. When it comes to the most important day of your life, you want the romance, passion and perfection that has been a part of the fairytale you've always dreamt of. At the Royal St-Lawrence Yacht Club, attention to detail and dedication to excellence will ensure your day is the essence of perfection. Along with the best in fine dining and elegance, the Royal St-Lawrence Yacht Club set on the shore of Lake St-Louis is in a class of its own. 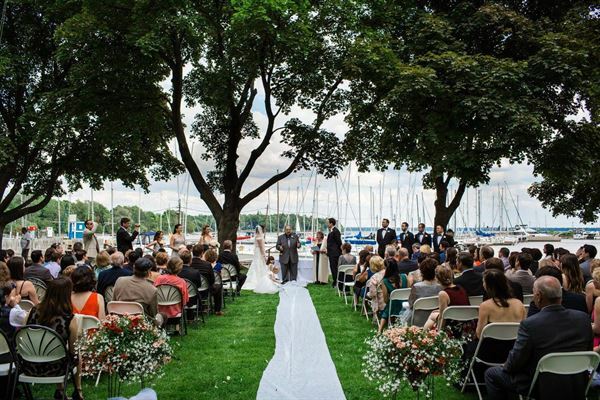 Imagine arriving at your reception via private jetty after a romantic cruise on the Lake St-Louis or watching the sunset with your pre-dinner drinks. Whether you are looking for an intimate elegant occasion or an event to impress, the Royal St-Lawrence Yacht Club and our partners canensure your day lives up to all your expectations. Working behind the scenes, our Chef and his team select only the finest produce available to create exotic appetizers, mouth-watering entrees and main courses, followed by sinfully elegant desserts, all tailored to suit the theme and atmosphere of your wedding.